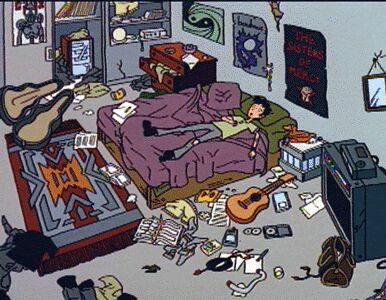 Trent Lane is a fictional character created for the MTV animated series Daria. He is the older brother of Jane Lane and former crush of Daria Morgendorffer. He plays lead guitars, vocals and clapping for Mystik Spiral and owns the Trentmobile. At the beginning of the show he is 21 years old. 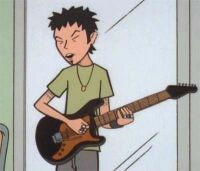 In the third draft of the Mystik Spiral pilot, he is described as "laid back, spiky-haired Jakob-Dylan-like singersongwriter and heartthrob". Appearance-wise Trent is tall and spindly with wild black hair and a goatee. Between Season 1 and 2, the appearance of his goatee changed from 3 stripes of hair to a small triangular "soul patch", and would remain that way for the remainder of the series. He has three ear rings in each ear like Jane and sports a tribal tattoo he got out of a magazine. His speech is laid back and he often coughs when he tries to laugh. Trent is a narcoleptic slacker who spends most of his time oblivious to the world. Still living at home affords him a carefree life style that allows him to pursue his twin passions of music and sleep. Why he sleeps so much has never been elaborated upon, whether it be a literal case of narcolepsy or purely the side effect of a rock and roll lifestyle. He can nod off any time or anywhere, which Jane has said is an annoying habit while he’s driving (and in one episode this actually happened). This complete slacker lifestyle also involves the inability to keep a schedule, and he will keep missing the start of rehearsals or gigs; he claims that watches depress him because he's always late, and that's why he never wears them. In a rare interaction with Tom Sloane in "Mart of Darkness", he drives Tom to frustration and despair with his slacker ways. Despite his zoned-out nature, he's proven to be quite capable of identifying when something's wrong with Jane or Daria, and taking action to sort it out. Notably in "The Misery Chick", after Jane had been avoiding Daria and everyone else, Trent "forgot" that he'd been asked to tell people she was out and said he "thought" Jane might be upstairs. During his non-waking hours he likes to practice. He's been known to practice the opening to Nirvana's "Come As You Are" for hours, and when rehearsing his own songs the volume is cranked to maximum. He can also get distracted by random things, such as the novelty settings and tunes on a keyboard or comparing vinyl to CD (without realising he's listening to the radio instead). 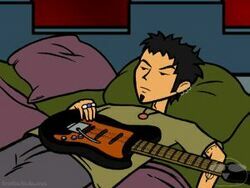 He even sleeps with his guitar, which he and Jane joke is counted as practice. He also spends his time trying to invent lyrics. He can be inspired to start talking in lyrics or writing them, at any time or place. This too is another bad habit he has while driving, and in conversation (he once started doing a song about betrayal right after he'd tried to reassure Daria that she hadn't betrayed Jane). While he can play the guitar well enough and nobody has ever commented negatively on his ability to play, his lyrics are usually quite inane. Songs have included lines like "you're cutting off my nose to spite my face/OW! My nose!/OW! My face!". Every song is designed to have simplistic rhymes. Jane has made snarky comments about Mystik Spiral's abilities and chances, and even Trent himself ("Jane's Addition") once said that the songs in the band's second set were "just the ones that weren't good enough for the first set" and that he'd leave if he wasn't in the band. Trent is usually enthusiastic (as much as Trent can be enthusiastic) about his music and the band, and will make grand statements about their future and their artistic merit. "Road Worrier" and "See Jane Run" showed flashes of doubt and angst, however: in the former, he worried he might fail, and in the latter he expressed discontent about the state of his career, referring to club audiences as using "[his] the backdrop to their pathetic mating dance... they just want something loud going on so they don't have to talk". According to "Art Burn", Mystik Spiral never play cover songs as that would undermine their creativity. 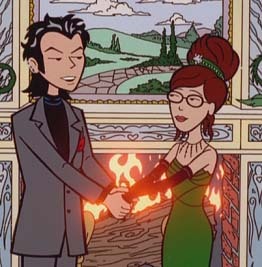 Trent deliberately flirting with Daria, in "Pierce Me"
Despite knowing that he was flaky, Daria had a crush on Trent for a few years in high school (first three seasons of the show). In their first encounters, she could barely talk when around him and spent half of "Road Worrier" deliberately holding back on her sarcastic remarks for fear of offending Trent. (It turned out Trent found them amusing.) The idea of embarrassing herself in front of Trent was a great fear of hers, and Jane would several times deliberately leave them together. Trent appeared oblivious to her crush for most of its duration, but according to Anne D. Bernstein, Trent had noticed the crush around the time of "That Was Then, This is Dumb" "but he would never lead her on too much". . 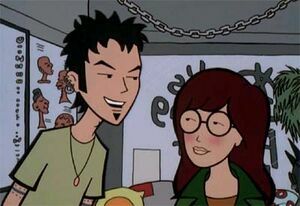 In "Through a Lens Darkly", he made complimentary comments about Daria's appearance for her benefit, and in "Pierce Me" he made complimentary comments about her as a person, telling Monique in front of Daria that she was "the coolest high schooler I know". In "It Happened One Nut", he also deliberately avoided a nut stand because Daria was working there and would clearly be embarrassed if he saw her, and in "Pierce Me" he deliberately waits before entering his house so as not to embarrass Daria. "Pierce Me" also shows him deliberately using the crush to steer Daria into having a piercing: when she's unsure, he outright flirts with her, telling her she'd "look hot" while giving an interested smirk, when when was clearly blushing and nervous over the attention. MTV's "It Takes Two to Tangle" described the lack of any real action as "a rare example of passive-passive behavior." In the end, it became clear to Daria in "Jane's Addition" that it wouldn't work out, after Trent utterly failed to assist her and Jane like he'd promised. They realised they had differing views on things, and Trent implicitly brought up their chances of a relationship while talking about the assignment: "I guess it wasn't such a great idea for us to get together... on this." He did express regret as he'd always thought she'd understood how he felt. After the conversation, he gave her a peck on the cheek. In the off-canon canon IIFY Post-Movie Chat, when asked if he had a crush on Daria, Trent simply said "no". Ironically, Trent's voice actor claimed he thought they could make a good couple: "They complimented each other greatly. Trent the dreamer, Daria the realist. I would like to see them get together after Daria graduates college." Outside of the crush, Daria is still someone whose advice and views Trent respects. He provides advice and assistance to Daria when needed - and after the events of The Kiss, Trent tried to help get Daria and Jane back together as friends again. Trent and Uncle Max. Note the different facial hair for S1 Trent. His parents Vincent and Amanda allowed Trent, like all their children, to do as he pleased in his youth. A few quirks of his childhood were living in a tent for six months, and having gone through an ‘orange skin phase’. Amanda and Trent remember the tent affair differently: Amanda thinks Trent was just playing around and later lost interest, while Trent was actually waiting for someone to invite him back into the house and sounds upset that nobody ever did. He's been to Lane family reunions before, and like Jane he is horrified by the prospect of any more of them. He is particularly irritated by Uncle Max Lane, a heavy drinker who says he likes Trent because he reminds him of himself, i.e: "You're a BUM! You're a lousy BUM!". Trent appears to have heard this speech several times. At some point, he and Jane shared a room. The music website Reburb (an archived MTV website) reveals that Trent first met Jesse Moreno at age 12, during the summer. They took hold of Trent's dad's old acoustic guitars (he later explained about tuning) and formed many bands ("'Wax Lypps,' 'Indyan Burn,' and occasionally 'Boa Constryctyr'"), playing "angst-driven power pop and Weird Al Yankovic covers" for family and friends. "They decide to turn electric when they realized that it would be louder." During his time Lawndale High School, Trent was scheduled for some classes alongside Tommy Sherman, though like the football player he "may have missed a few classes". Reburb says he met Max Tyler at school after advertising for a drummer, and the three played "trance punk" in basements throughout their teen years. He knew Timothy O'Neill and once wrote "Down With The Man" on the teacher's car. ("Lucky Strike") According to Is It College Yet?, Trent missed his own graduation. 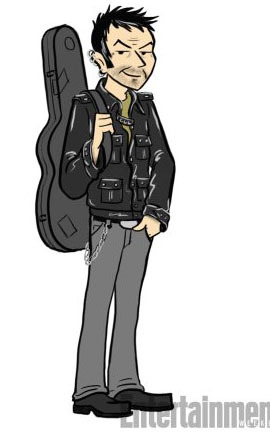 During his school days, Trent once had a summer job at Lawndale Diner - he wrote a song about it. After graduation, after which point he met Nick Campbell, Trent's "career" involves fronting the Spiral and writing lyrics. With the Spiral he mainly plays brew pubs and grunge clubs though they have been known to play high school house parties for the right price and even a child’s birthday party to get out of a ticket. He’s never known to have been formally employed in a conventional job but once wrote a jingle for Happy Herb's used cars in exchange for twenty bucks, an hour of studio time and a set of new tires; this was a deep, dark secret he didn't want anybody knowing. He says in Pierce Me that, for reasons he doesn't ever want to talk about and sounds angry about, he "can't" step foot in a bookstore. He has a girlfriend called Monique, who is also in a band; the two break up and get back together on a regular basis. The two of them used to be in a band together. MTV's "It Takes Two to Tangle" stated the couple are "compatible in many ways in terms of lifestyle and temperament, they may have trouble bonding due to their both being too cool for words". Both of them are friends with Axl, who runs the local tattoo and piercings parlour. When Jane was applying for colleges, Trent took a hostile attitude and said she was selling out. He later apologised and admitted he didn't think that really: he was upset that she was leaving home and worried he might lose her. Jane reassured him that she wouldn't let him "slack off" being her brother. He accepts that he’ll probably end up a townie playing Doors covers but at least he’s doing what he loves now and that’s all that matters. "While his Mystik Spiral days are over, Trent has found, well, not success exactly, but... a functioning band in Trent Lane and the Mystikal Explosion. He lives with his four bandmates in Queens. Trent had some financial success with Mystik Spiral's one-hit wonder, "Freakin' Friends," but since then has been making ends meet as a bartender. He and Jane still spend a lot of time together, and Daria often joins in. (See? It's not weird anymore, guys.)" Despite what Glenn Eichler and the others writers intended, Trent/Daria shipper fanfiction abounds in fandom. The production rate of shipper fics used to be quite intensive during the first few years of the show, both fics that showed them getting together and fics that played up the crush (C.E. Forman's "Lost Stories" fics). The number have gone down since then, and anti-'shipper fics have turned up to poke holes in the pairing, like "I've Waited Here for You" by Kristen Bealer. New Trent/Daria fics are still a frequent sight, however - Life As We View It / Second Glance by GingerLove84; "Reunited and It Feels So Good" by Person - however, as are fics that have the pairing in the background ("Drive" by TAG). Sometimes, as with "Reunited", these are post-show to get around the age gap. 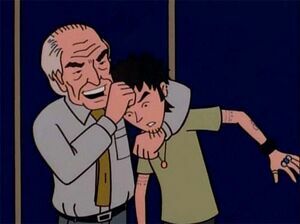 The main depiction of Trent in fanfiction is either a similar role to canon - a helpful, decent (but lazy) ally of Daria and Jane. Some present a Trent who has become far more successful: often, Mystic Spiral (or Trent on his own) have become a successful band, such as several fics by Nemo Blank. Others will play up Trent's worse attributes and his obvious lack of a future for dramatic purposes, like E. A. Smith's "Nowhere Man". A minority of fanfics take a deliberately negative view of Trent, such as The Angst Guy's "Darkness" where an older Trent is a physically and emotionally abusive man, and Smileyfax's "My Best Friend" where Trent (in a deliberate twisting of canon) has always been an abusive psychotic. In Wouter's Dariarotica story "I trust you" Trent is seen in his thirties with a receeding hairline (Much like his father's) which he tried to compensate with longer hair in the back and a full allround beard-moustache. In that story Trent is still pretty much the laid back, soft spoken character of the series. In the Latin American dubbing, he was voiced by Alfonso Obregón. This page was last edited on 1 May 2018, at 20:37.